To register your player for 2019’s intramural season, click here. Note- Intramural ultimate will run on Mondays and Wednesdays this year from 6-7:30pm. It’s a new year, and in Rogue country, that means it’s time for a new uniform design! We use our uniforms every year to not only differentiate ourselves on the field from our opponents, but to also tell the story of our team. 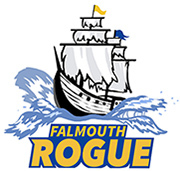 Being the new sport in a town where the school mascot is the Yachtsmen, we adopted the name Falmouth Rogue back in 2016, the first year we ventured out and printed full sublimation jerseys, a type of printing that allows us to use every part of the shirt for our design. In that first year’s shirt, we see a vicious sea monster fighting against the valiant Rogue ship and its hook-handed pirate captain. The next year, 2017, having seen the Rogue light, that sea monster has joined with the captain and the Rogue ship to take on a new foe- the giant crab. In 2018, the crab joined up Rogue similarly and the whole crew was fighting on the jungle beaches against a beautiful tropical bird. This year, you guessed it- the bird has joined Rogue! Now our expanded cast of Rogue characters- the pirate, the Rogue ship, the tropical bird, the giant crab, and the octopus sea monster are facing off against a powerful jungle cat on the banks of a piranha-infested river. Yikes! 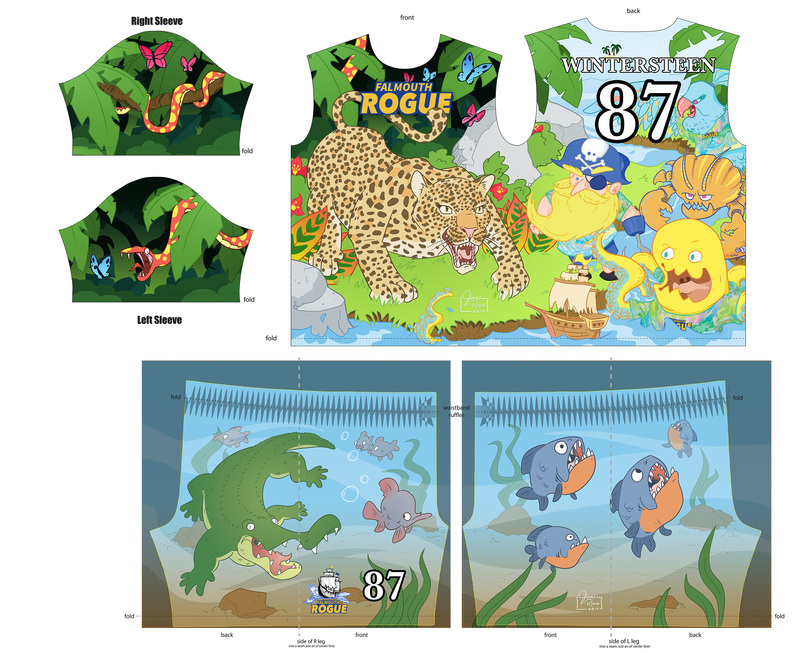 This year is the second year our uniforms have featured a female character, reflecting our co-ed team, making the overall gender balance of the Rogue pantheon at two girls- the tropical bird and jungle cat, and three boys- the captain, the crab, and the octopus, leaving next year’s anticipated female character to balance things out. Oh, and the non-gendered Rogue ship! Next year will be the last year we add a new character. After that, we’ll have the Rogue ship, the captain, and a line of five players- the octopus, the crab, the tropical bird, the jungle cat, and next year’s female character. At that point, having established all of our Rogue characters, we’ll make some kind of interesting visual style change- that will be in the 2021 season. HUGE thanks to illustrator John Rioux, who is a former Falmouth student now going to school in Boston who stepped in to draw this year’s shirt. We’ve been lucky to have fellow former Falmouth student Joey Han (and a member of the very first FMS ultimate team back in 2013) draw our shirts, but Joey was particularly swamped at college this year and handed over the illustration reigns to his friend John. Thanks for the fantastic recommendation Joey! We’ll have uniforms back from the printer later in May! Roll Falmouth Rogue! The 2019 season is set to begin! We’re just a few weeks out from the start of our pre-season sessions. There are a few upcoming dates that I want you to know about. I’ll be there to throw the disc around and to answer any questions from players interested in playing on the travel team. Some of the high school girls ultimate players will be coming out to throw the disc around and talk about ultimate. Coaches will be there as well to answer any questions about the program. We’ll be holding our annual parents and players meeting at the Mason Motz Activity Center, instead of the library as we always have, due to library renovations. Come out to meet the coaches and to hear all the details you need to know about the upcoming season. I will also have uniform samples of all sizes for anyone wanting to verify sizes. If you need to change sizes and have already registered- no worries- just let me know about the size change after the meeting. We kick off the season on April 2nd! Our preseason schedule will have us practicing on Tuesdays and Fridays from 3:30-5pm in the FMS gyms. We’ll be scheduling a few random extra practices, to-be-announced soon, but until we get outside on the grass, Tuesdays and Fridays are our regular days. I’m going to be encouraging players to get out and jog on at least one other day throughout pre-season. Once we get outside in May, we’ll be moving to our five-day-a-week schedule, with the travel kids playing two days a week with intramural and then three days as a travel team. Announcing the Rogue Ultimate Camp! I’m super happy and excited to announce the launch of a new Rogue Ultimate project- the Rogue Ultimate Camp! This overnight co-ed camp is for girls and boys who will be going into the 5th through 8th grades in the fall of 2019. We’ll be packing in the week with lots of high-level ultimate coaching and tons of fun play. Camp will kick off on Sunday, July 14th and run through Friday, July 19th up on the beautiful campus of Colby College in Waterville. You can click over to our new website to learn more! Head for the hills! Or at least stay inside when the lightning gets here in a couple of hours. The timing of the incoming weather is looking a bit dodgy, so no intramural today. We don’t mess around when lightning is on the menu. The 2018 Intramural season kicks off next week! Our intramural team, lead by Coach Laura, meets twice a week on Tuesdays and Thursdays and is open to girls and boys living in Falmouth in grades 2-8. Players will be divided up by grade, with the 2nd-4th graders using a cool new special smaller disc in their games, the 5th and 6th graders matching up, and the 7th and 8th graders playing together. Players in the 2nd-4th grades will play from 6-7:30pm, while players in the 5th-8th grades will play from 6-8pm. The cost to register for the intramural team is $65, though as always, no player will ever be turned away for financial reasons. If the cost of playing is at all an issue, we just ask that families pay whatever is affordable. The cost of participating should NEVER factor into a player’s decision to play ultimate. Registration open until the end of the month! We’ve done some logistical juggling and are now able to keep registration open for Falmouth Rogue through the end of the month! The good news is that our first practice is on Friday, March 30th and the deadline to register isn’t until the following day, March 31st. So players can now check out the first practice before making the final decision to commit to the full season!